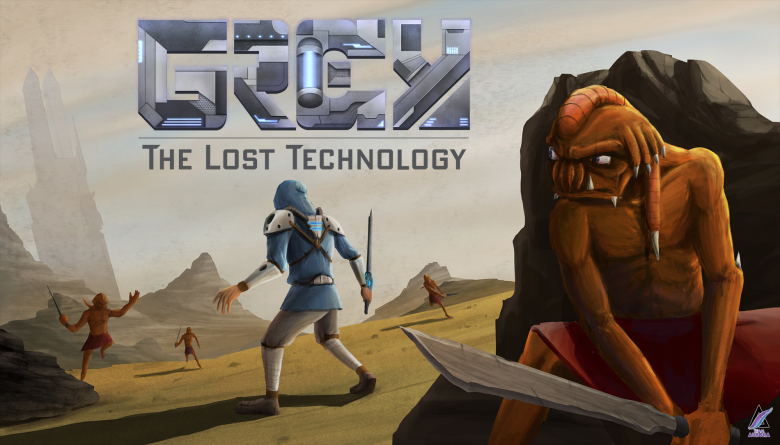 Grey: The Lost Technology is the first project for Team Aurora, the independent game studio a few friends and I co-founded. Grey was successfully Kick-started in May of 2012. We were able to travel to PAX East and meet with a lot of fellow developers and met some really cool people. The game is an action RPG that explores the possibility of an overpopulated Earth and the humans who leave to find a new planet to call home. 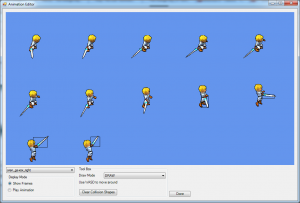 The game is programmed in C# using the XNA Framework. The game does not use external libraries, and instead uses the game engine we have programmed called “Aurora2D”. Alternatively, it can direct you to more dialog. Implementing this is primarily about a good structure and design of the dialogue objects themselves. A Talker, when spoken to, evaluates each dialogue that is tied to them. They accept commands and react accordingly. Since we created the game with a framework, and did not use an existing game engine, we needed to create a game editor. The game editor is something of my own creation with the exception of the Navigation Mesh Editor written by our other programmer, Jacob Jackson. 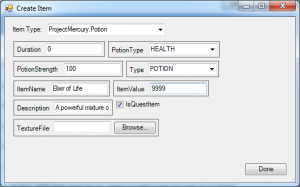 The editor is an XNA project that is supplemented by Windows Forms. When the game launches is creates the Control Panel that the designers will be using to manage game assets and map textures. By adjusting the Edit Mode, you will have access to different functionality offered by the editor. For example switching from TILE (which allows you to place all of the items offered in the tabs) to PATROL_EDITOR, you will be able to draw patrol path lists that and have the ability to customize them. There is also an Edit Mode for drawing the Navigation Mesh on a map. Lastly, there is another edit mode for drawing world-space collision geometry. Some of the coolest parts of the editor are in the Tools Menu. The tools menu provide a designer with the ability to add collision geometry to each and every character model/animation that exists in the game. Using the Collision editor is simple. A list is populated with all the animations from the spritesheets and then the selected spritesheet is drawn and all that is required is to click and drag to draw a collision box. Rotating the collision box is done by holding space after you dragged the box out to it’s appropriate size. A quest must have steps to be completable. Think of a game like The Elder Scrolls: Skyrim where a quest often times has a few parts that must be completed to complete the overall goal. To evaluate each of the Continue Requirements, I hook events for each running quest and then when anything in the game happens and fires an event, each quest you are completing will be updated concurrently. 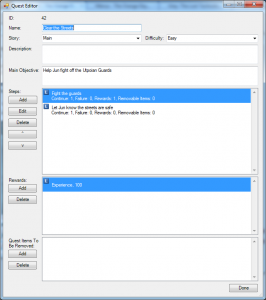 This event driven implementation is the core of the quest system. As a supplement, I created what I like to call an action list. The action list is a rolling list of every action that our hero, Oren, performs in the game, whether it’s killing an enemy, clearing a spawner, or changing maps, it all gets recorded as separate actions. This implementation solves the problem of a player exploring the map and killing a boss or character that spawns once in a game, then getting the quest tells you to defeat him, and not being able to complete it. 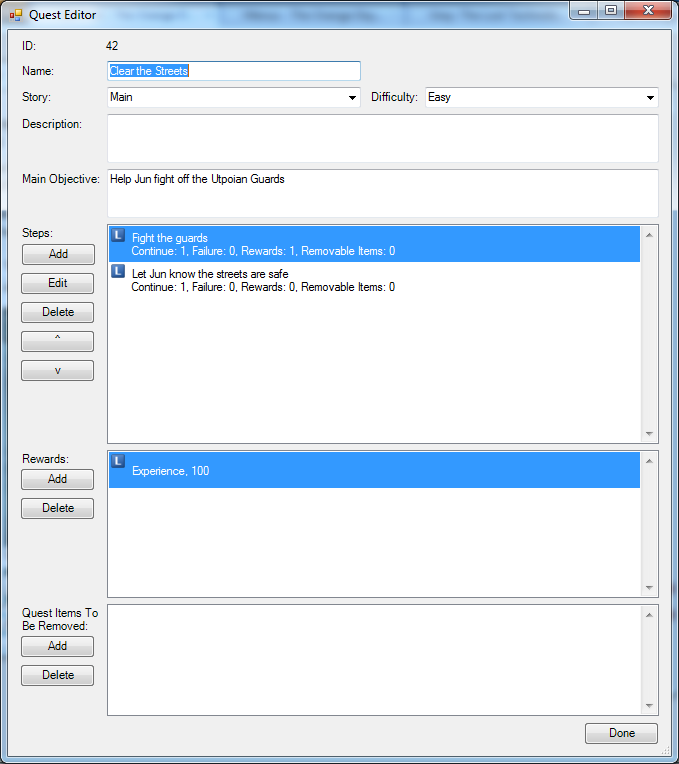 A quest checks the action list in parallel to the events that it handles. 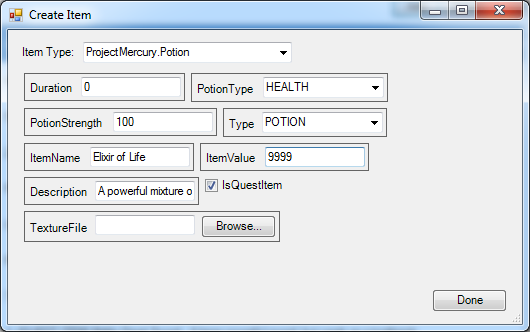 The Item Editor is also really cool because to complete this I implemented a class parser using C# reflection to handle populating the editor. There is a main recursive function that handles the population aspect. This function takes the object and uses reflection to evaluate each public property and generate a component that best fits the type of property it’s evaluating. The library is fully featured and provides us with a very solid base to build Grey with.